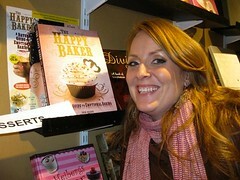 In the season 5 episode 6 of Dragons’ Den the happy, humours, and driven Erin Bolger pitched her book “The Happy Baker – A Dater’s Guide To Emotional Baking” and made a $50,000 deal on TV with Calgary-based Dragon/investor Arlene Dickinson. – What lead Erin to write and self-publish the book? I asked if she has got any help in writing the funny bits in the book? For example, did she have a comedian friend to help her write? – An update on Erin’s deal. On TV Erin & Arlene agreed to: $5,000 cash, $20,000 in travel miles, and $25,000 in PR services, in exchange for 30% of the proceeds from the book sales. – How did Erin come up with the 300,000 copies sales target? Thats one out of every 100 Canadians! How far along has Erin reached the target so far? – We also talked about some of the recipes in the book. Here are links to the recipes for “My Mom’s Cupcake” and “ME + YOU – YOU = ICE CREAM COOKIE SUNDAE“. Both look very yummy. – We also talked about Erin’s Paris cookbook festival experiences. And her experience in visiting the world famous Pierre Herme shop in Paris. This entry was posted on Wednesday, February 24th, 2010 at 7:59 PM and is filed under book, Business, Calgary, Canada, Dragons' Den, Entrepreneurship, InterviewByKempton, InterviewByKempton-Business, Marketing, people, Television, Toronto, Video, YouTube. You can follow any responses to this entry through the RSS 2.0 feed. Both comments and pings are currently closed.